IGN is finishing the season strong. Not only does this week’s agitprop praise transparently hackneyed story shortcuts (see: Moe’s interactions with the Lovejoys and the Nahasapeemapetilons), but goes so far as to offer a suggestion about how it could’ve been even better! IGN couldn’t ignore the stupidity of using an elopement with Moe as the plot fulcrum, but rather than ignore the awful fake tension it put on the rest of the episode, they offered up a little change and called it a day. IGN, it’s not sycophantic criticism, it’s constructive sycophantic criticism. I’ve edited out the synergy, though I left the last paragraph largely alone. Enjoy. The Simpsons Zombie Simpsons has been on quite a run. The last several episodes have been some of the best worst we’ve seen in recent seasons. And the run continued with "Moe Letter Blues." Sunday’s episode was a nice hacktacular stab at a Mother’s Day treat, told through long winded narration and goofy, cliched flashbacks, all while scoring whiffing big with on the laughs. The storytelling in "Moe Letter Blues" was what stood out first. Things started with Moe narrating, and then moved on with flashbacks from Homer, Apu and Reverend Lovejoy as they tried to figure out which of their wives might be running off with Moe. This could have been was clunky and unnecessary, but and the writing made it work even worse than it had to be. The flashbacks flowed were tied together well haphazardly and made sense only from an omniscient Moe’s point of view. The episode even wisely made failed to make fun of its own set-up. While Moe was easily in place to witness the troubles between Homer and Marge and Apu and Manjula, he was comically shoehorned into the flashback for the Lovejoy’s and Apu and Manjula. There, Moe randomly poked his head out from behind the church to witness the turmoil and the Nahasapeemapetilons stopped at Moe’s for some reason. The issues between the couples offered up a number of laughs teevee cliche couple arguments. Homer and Marge’s problems are nothing new to the series. Homer has offered up loads of relationship advice throughout the series’ Zombie Simpsons 400 200-plus episodes, and he added another great one bland stinker on Sunday: "Women don’t mean anything by anything." The most least fun, though, came between Apu and Manjula. Apu is best known as used to be the pleasant and chipper Kwik-E-Mart clerk, but some of his most memorable moments have come from an annoyed and angry Apu. His arguments with his wife in this episode were the standout bits a reminder that we liked the old Apu better, including their debate over the radio station ("Having a ‘Ma-Hot-Ma or Ma-Not-Ma’ contest is not a jape. It is sexist sacrilege. "), and then later forgetting a ‘tuplet. Along with the fun boring, interweaving main story, "Moe Letter Blues" was packed with a number of other great gags time killers. The barfly rodeo was fun way too long, especially Lenny as the rodeo clown which could’ve been funny if it hadn’t taken fifteen seconds. Weasel Island offered up a lot of no laughs, most from including the meta amusement park advertisement: "Warning: You many not be amused." The episode also included a fantastic slow paced Itchy and Scratchy cartoon, plus a brief but hilarious underwritten guest spot from the voice of Saturday Night Live, Don Pardo. When Moe wondered out loud in his narration what sort of dough Pardo made from voiceover work, his distinct voice chimed in with, "I make more than you can possibly imagine, and I’m making it right now." 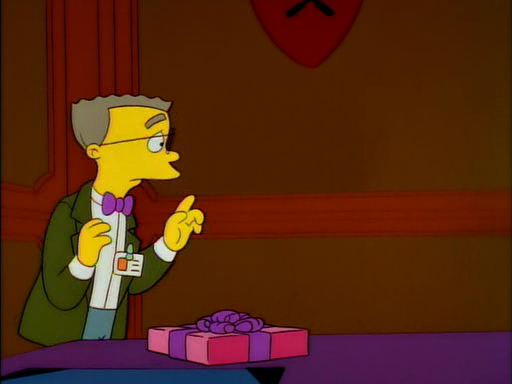 One issue I did have with the episode was Moe’s, "I’m leaving town forever and taking one of your wives" statement in his letter. You know there’s no way Moe would ever be leaving the series or running off with any of these women, so the claim never held any drama. As the men returned home, you never expected to see that one of the wives had run off. It might have worked better if Moe had simply said he was going to sleep with one of the women. This would have been a little more believable in the realm of the series and certainly would have been more in line with Moe’s character. That aside included, however, the storytelling and humor relentless “suspense” of "Moe Letter Blues" delivered yet another great tired episode from a very strong yet another tired season of The Simpsons Zombie Simpsons. So… IGN, the place which manages to take a pathetic CBG gag and make it sound like something amazing, completely ignores the only bearable part of this episode in favour of the part which features more cliches than the most? Oh, and really, having Moe sleep with one of them wouldn’t be any better. Besides the fact that, well, it’s Moe, it’d still have roughly the same effect. Heck, it’d be more likely for Moe to say he’d kill one of the wives. Moe Syzlak (a.k.a. Mr. Two-Face) needs to get his own romace (and succeed), instead of butting his mug face into other people’s marriages. Who is he to tell Homer, Lovejoy, and Apu how to value their wives more, especially when it’s the WIVES who are at blame in this episode. 1. Marge Simpson: First off, Marge blames Homer for nearly EVERYTHING, even things that happened. Sure Homer’s blunders cause embarrassment towards those closest to him, but who can stay mad at him. He can’t help it! He’s low on the IQ factor, so she should cut him some slack. But because this is Fox we’re talking about, they should just spend less time together and focus on their own individual hobbies and ways of life. And she usually puts blame on him (and Bart & Lisa) for whatever happens in public, because she’s not even bold and daring enough to stand up to her fickle acquaintances (Luann, Helen, Bernice, Agnes, Cookie Kwan) who mock her based on whatever her family does on their own. She is America’s capital TV nag. 2. Helen Lovejoy: Helen whines about her needs not being paid attention to, but she is by far the most annoying female out of all of Marge’s fake friends. In general, she is a textbook example of a pretentious gossiper. during her occasional (or daily) female bridge club meetings/outings, she finds it necessary to spread bad gossip about Marge and the rest of the Simpsons. Let’s also keep in mind that this is the same women who preaches “Think of the children”, yet she was one of the protesters who got Itchy & Scratchy (a cartoon show loved by kids everywhere) canceled, and on top of that, she (and her husband) not only accused Bart of swearing when he said the word “but” at their house(which is a PREPOSITION, not a curse) and threw him for it (even when he was on his best behavior), but also accused Bart from stealing from the collection plate. She is also a liar when it comes to promises. Even after promising that she’ll use her gossip for good instead of evil (upon Marge’s return from jail (9F20)), she continues as if nothing ever reconciled. Even after all of those things (some more frequently then others), she excepts people to pay attention to HER needs, namely her husband!? If Helen had to see a true manifestation of herself in a mirror, she would hopefully change her attitude and judge of character. The only reason those two are married at all is because Lovejoy is just as pious bias as she is. It’s plainly obvious that the Lovejoys do not practice what they read or preach, or practice so much of it that they bring bad judgment upon others. Surely in a real society, a benevolent God would frown upon those who would speak ill of those who have no ill intentions or suffer from unintentional blunders. 3. Manjula Nahasapeemapetilon: Long ago, there was but a simple convenience store clerk from India, who worked to make a living and pay off his college dues by serving retailer food goods. After growing closer to the Simpson and finally earning his U.S. citizenship, he was able to enjoy his life as a bachelor. That was until his mother (a stricter Agnes Skinner) came back into his life, and dragged him by the ear into the checkered world of ARRANGED MARRIAGES. Even though Apu told her how he felt about not wanting to be married, she ignored his plea and arranged the marriage anyway. While things seemed bleak on the day to be wed, Apu gazed upon the beauty of his soon-to-be wife Manjula (a childhood girl from his past), who did not approve of the wedding either. Though they decided to go through with the wedding, more tribulations would soon follow. Eventually, the beautiful Hindi woman Apu married in bliss, became an uppity, bossy, demanding, shrew. First, she would nag Apu for spending more time at work than at home, then the both of them would be caught under the allure of parenthood. After having trouble conceiving, the two who secret toy with nature through fertility drugs, releasing eight rambunctious infants better known as the Octuplets, whose initial arrival into their world would create a plethora of stress for the Indian store clerk and ending his freedom marginally, due to their initial colic/high-spirit playfulness. Finally after becoming weary from his recent life developments, Apu was lead into temptation by the alluring Annette, causing him to cheat on his wife. After Manjula found out, she kicked him out, threatened to divorce him, but changed her mind and allowed him to return, under the condition of completing a list of bizarre and senseless tasks (excluding task #1). Even after Apu made amends, the bitterness of their marriage (combined with guilt and parental stress) would remain. In a present sense, Manjula criticizes Apu on nearly everything, from what he does to his own interest and traits. In this particular episode, they get into some estupido argument over radio music. Then she blames Apu for forgetting Gheet (1/8 octuplets) at Moe’s Tavern. First off, it’s hard to keep track of eight wild banditos who run around loose like cross-county lice on an Afghan hound. Secondly Manjula should really put herself in the clerk’s shoes and see how hard his life is. Perhaps then, she would ease up on Apu. As for the Octuplets, instead of them being a rambunctious group of eight generic babies (designed to be in their “terrible twos” phase (one season later of after BABF03) to were on Apu’s nerves), they should have more development. If babies like Maggie, Ling, and Gerald “Unibrow” Samson can be developed to a T, there should no problem giving one or three of the Octuplets some individual plot focus. Moe also has some nerve telling the audience to value their wives and mothers. Mother generally wear on people last nerves, wear they long for freedom from their authority. As for wives, men are often villainized in generally nowadays, by certain female rights groups. Married men however are often derailed from their life goals by the whim of their wives and deprived from any extracurricular interests. One day, thing may change around for the better. But for now, Moe (or anyone else) has no business imploring any real-life audience to do anything that people would/wouldn’t do naturally on their own, especially when it’s one-sided. There was a plot resolve, but Moe had to kill it by being preachy. Overall, there was enough tension to turn any self-respecting person away from romance. Fox’s signature move in promoting marital conflict. Ignore the previous post, due to two many typos. This is the revised review. Moe Syzlak (a.k.a. Mr. Two-Face) needs to get his own romance (and succeed), instead of butting his mug face into other people’s marriages. Who is he to tell Homer, Lovejoy, and Apu how to value their wives more, especially when it’s the WIVES who are at blame in this episode. 1. Marge Simpson: First off, Marge blames Homer for nearly EVERYTHING, even things that happened out of his control. Sure Homer’s blunders cause embarrassment towards those closest to him, but who can stay mad at him. He can’t help it! He’s low on the IQ factor, so she should cut him some slack. But because this is Fox we’re talking about, the two should just spend less time together and focus on their own individual hobbies and ways of life. Marge usually puts blame on him (and Bart & Lisa) for whatever happens in public, because she’s not even bold or daring enough to defend herself against the judgment of her fickle acquaintances (Luann, Helen, Bernice, Agnes, Cookie Kwan) who mock her based on whatever her family does on their own. She is America’s capital TV nag. 2. Helen Lovejoy: Helen whines about her needs not being paid attention to, but she is by far the most annoying female out of all of Marge’s fake friends. In general, she is a textbook example of a pretentious gossiper. During her occasional (or daily) female bridge club meetings/outings, she finds it necessary to spread bad gossip about Marge and the rest of the Simpsons. Let’s also keep in mind that this is the same women who preaches “Think of the children”, yet she was one of the protesters who got Itchy & Scratchy (a cartoon show loved by kids everywhere) canceled, and on top of that, she (and her husband) not only accused Bart of swearing when he said the word “but” at their house (which is a PREPOSITION, not a curse) and threw him out for it (even when he was on his best behavior), but also accused Bart of stealing from the collection plate. She is also a liar when it comes to promises. Even after promising that she’ll only use her gossip for good instead of evil (upon Marge’s return from jail (9F20)), she continues as if nothing ever reconciled. Even after all of these qualities (some that are more frequent then others), she expects people to pay attention to HER needs, namely her husband!? If Helen had to see a true manifestation of herself in a mirror, she would hopefully change her attitude and judge of character. The only reason those two are married at all is because Lovejoy is just as pious bias as she is. It’s plainly obvious that the Lovejoys do not practice what they read or preach from the bible, or they practice so much of it, that they bring bad judgment upon others. Surely in a real society, a benevolent God would frown upon those who would speak ill of those who have no ill intentions, but suffer from unintentional blunders. 3. Manjula Nahasapeemapetilon: Long ago, there was but a simple convenience store clerk from India, who worked hard to make a living and pay off his college dues by serving retailer food goods. After growing closer to the Simpson family and finally earning his U.S. citizenship, he was able to enjoy his life as a bachelor. That was until his mother (a stricter Agnes Skinner) came back into his life, and dragged him by the ear into the checkered world of ARRANGED MARRIAGES. Even though Apu told her how he felt about not wanting to be married, she ignored his plea and arranged the marriage anyway. While things seemed bleak on the day to be wed, Apu gazed upon the beauty of his soon-to-be wife Manjula (a childhood girl from his past), who did not approve of the wedding either. Though they decided to go through with the wedding, more tribulations would soon follow. Eventually, the beautiful Hindi woman Apu married in bliss, became an uppity, bossy, demanding, shrew. First, she would nag Apu for spending more time at work than at home, then the both of them would be caught under the allure of parenthood. After having trouble conceiving, the two who secret toy with nature through fertility drugs, releasing eight rambunctious infants better known as the Octuplets, whose initial arrival into their world would create a plethora of stress for the Indian store clerk and ending his freedom marginally, due to their initial baby colic/high-spirit playfulness. Finally, after becoming weary from recent developments of his life, Apu was lead into temptation by the alluring Annette, causing him to cheat on his wife. After Manjula found out, she kicked him out, threatened to divorce him, but soon changed her mind and allowed him to return, under the condition of completing a list of bizarre and senseless tasks (excluding task #1). Even after Apu made amends, the bitterness of their marriage (combined with guilt and parental stress) would remain to this day. In a present sense, Manjula criticizes Apu on nearly everything, from what he does to his own interest and traits. In this particular episode, they get into some estupido argument over radio music. Then she blames Apu for forgetting Gheet (1 out of 8 octuplets) at Moe’s Tavern. First off, it’s hard to keep track of eight wild banditos who run around loose like cross-county fleas on an Afghan hound. Secondly, Manjula should really put herself in the clerk’s shoes and see how hard his life is. Perhaps then, she would ease up on Apu and not be so petty. As for the Octuplets, instead of them being a rambunctious group of eight generic babies (designed to be in their “terrible twos” phase (one season later of after BABF03) to were on Apu’s nerves), they should have more character development. If babies like Maggie, Ling, and Gerald “Unibrow” Samson can be developed to a T, there should be no problem giving one or three of the Octuplets some individual plot focus. Moe also has some nerve telling the audience to value their wives and mothers. Mothers generally wear on peoples’ last nerves to the point where they long for freedom from their authority. As for wives, men are often villainized in general nowadays, by certain female rights groups. Married men however, are often derailed from their life goals by the whim of their wives and are deprived from any extracurricular interests. One day, things may change around for the better. But for now, Moe (or anyone else) has no business imploring any real-life audience to do anything that people would/wouldn’t do naturally on their own, especially when it’s one-sided. Honestly, you’re right on the money about men being villainized. I’m female, but I’m getting pretty sick of this too. I wish some of these “female rights” groups would realise that equality doesn’t mean putting men down, or assuming that there’s some kind of “unequality” going on because there are more men than women in a work place (I’m all for gender equality, but attitudes like that just make me sick). I was going to post some kind of comment about Helen, possibly in her defense (because I do like her as a character, if not as a person; at least she’s somewhat more interesting than the one-note characters the writers seem to love nowadays), but the truth is, you’re right; the story IS one-sided. We don’t really get to see much of any of the relationships from the mens’ perspective. We understand that the wives are ticked off, but the men are always portrayed as “selfish” for basically doing their own thing. Maybe the wives should’ve learnt to appreciate their husbands, too, because none of these couples really seemed particularly happy. Come to think of it, how does Moe even KNOW any of this stuff about romance and appreciating ones wives/mothers, anyway?